How many times have you seen a penny on the ground and walked past it without so much as pausing to consider the value of the loose change? Well, after today, you’ll pay closer to attention to the value of a penny. A Massachusetts man named Thomas Daigle recently paid off his outstanding mortgage balance using pennies – 62,000 pennies, to be precise. It all started 35 years ago, when a much-younger Daigle saw a penny lying on the ground and stopped to consider the very same quandary you and I probably have every time we find ourselves in a similar situation: is it worth picking up? Daigle’s answer was yes, and so began a three-and-a-half decade-long pursuit to collect and save as many pennies as possible. This spring, it paid off when Daigle was able to make the final payment on his mortgage using the nearly 400 pounds worth of pennies he’d found over the years. Put it toward my own housing goals. When I was younger, my father and I made a habit of tossing our spare change in an old butter churn (it was a piece of folk art, as my parents are not “churn your own butter” types of people). When my husband and I were preparing to buy our first home, my father and I finally emptied it. Over the previous 24 years, we’d amassed more than $1,700 in coins! We husband and I put that loose change toward our down payment, where it represented nearly 1.5% of the purchase price of our house. Give it to my children. To an adult, a penny is just a penny; sometimes, especially if it’s grimy, we devalue it even more than the single cent it’s actually worth. To a child, however, a penny is a treasure. Just ask my daughter – her piggy bank is one of her prized possessions, and finding a penny on the ground literally makes her day. Donate it. We’re all familiar with the Salvation Army’s ubiquitous red kettle campaign during the holiday season. I’m one of those people who rarely carries cash (or loose change) in my purse, meaning I often find myself shrugging and walking past the bell ringers with my head held low. If I socked away all the spare change I received or found over the course of the year, however, I’d be able to make a hefty donation to the Salvation Army – or any other charity that values our coins – and carry my head a little higher. Collect them for antiquities’ sake. Many foreign nations, including New Zealand, have gotten rid of their one-cent coins. Our federal government has proposed a similar move, and although it hasn’t happened yet, it could one day. If it does, pennies could theoretically become collector’s pieces. Hand them out as treats to kids on Halloween and other holidays. My husband remembers receiving quarters from a neighbor as he and his siblings went trick-or-treating as children. Use them as decorative pieces. 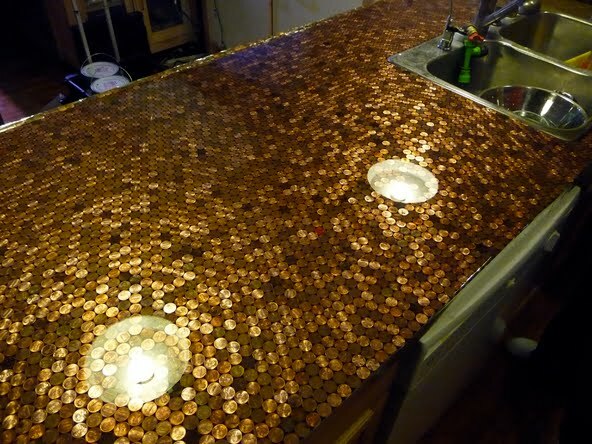 I’ve seen some really incredible pieces of penny-art recently, including this countertop made from pennies and this piece of penny-inspired artwork. I’ve got a feeling that both pieces are worth far more than the literal sum of their parts. Use them as pieces in board games. Not only does my husband keep a stash of pennies on hand for the occasional game of Chicken Foot, but we’ll also use a penny in place of a missing piece in a board game from time to time. Conduct science experiments with them. One of my favorite hobbies as a child was to clean old, dirty pennies with ketchup (or just vinegar, which is the active ingredient). The result? A bright, shiny, new-looking coin. Insert them into the novelty penny presses that you find at amusement parks, zoos, and museums. Instead of a perfectly round penny featuring Lincoln’s likeness, you end up with a flattened coin embossed with the image of a roller coaster, lion, or dinosaur skeleton. It’s the perfect (and possibly cheapest) souvenir. Great penny ideas. My grandma used to keep them in large mouthed bottles and then donate it to the church when it’s already full.